As mentioned before, the engine was based on an existing design, not from the GT-One's immediate predecessor, the V10-engined TS010, but from the slightly earlier Group C cars. This was a purpose-built 3.6 litre V8, equipped with twin-turbos. For its use in the new GT1 car, it was updated by Toyota Team Europe (TTE). Some weight was taken out and the rev range was changed to better suit the mandatory intake restrictors used to balance the field. It was officially rated at 600 bhp. With the help of cutting edge CAD systems, designer André de Cortanze created the exterior design between January and September of 1997. Intended to be run only at Le Mans and not in any of the FIA GT rounds, the GT-One featured a minimal frontal area and a relatively long tail, both intended to reduce drag. A design feature that particularly stood out was front wheel-well cut-out, intended to prevent pressure to build up inside the wheel-well. A single air-intake was squished into the roof, again with drag-reduction in mind. After initially being laid out on the computer, the shape was further refined the old-fashioned way; in a wind-tunnel, in Italy. 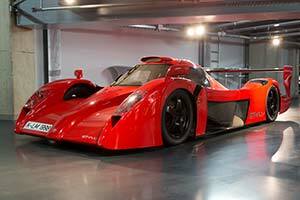 With the final design signed off, production of the GT-One commenced in October of 1997. Testing commenced in December and three of cars were ready for Le Mans in May of 1998. At scrutineering, the road-going version was also presented, which featured a slightly taller wing, a higher ride height, smaller fuel tank and catalytic converters. Two road cars were built but neither were ever sold.